Wombats are found in the forests and mountains of Southeastern Australia and Tasmania. Wombats are nocturnal creatures with strong legs and foreclaws, and they use their teeth and claws to dig extensive burrow systems. Their teeth continue to grow throughout their lifetimes and are used to efficiently tear fibrous material in plants that they eat. 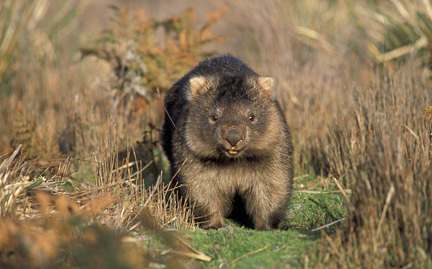 Wombats are threatened by hunting.